In a large soup pot, combine the EVOO, 2 turns of the pan, the onion, carrots, garlic and bay leaf and cook over medium-high heat for 5 minutes. Add the chicken broth, crushed tomatoes and tomato sauce, cover and bring to a boil over medium-high heat. In a large bowl, using a fork, combine the ground beef, parsley, egg, bread crumbs and 1/4 cup cheese; season with salt and pepper. Roll the meat into balls the size of a large walnut and drop each one into the soup pot (you should have about 16 meatballs). Simmer the stoup for 10 minutes. Stir the broken spaghetti into the pot and cook, stirring occasionally, until al dente, about 12 minutes. Turn off the heat, stir in the basil and season the stoup with salt and pepper to taste. Serve, passing more cheese around the table. In Recipes-list.com we have selected the most viewed recipes from category - uncategorized . Enjoy the best recipes specially selected for you! 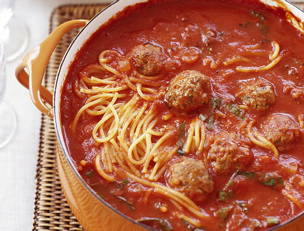 Mini Meatball and Broken Spaghetti is the right choice that will satisfy all your claims.